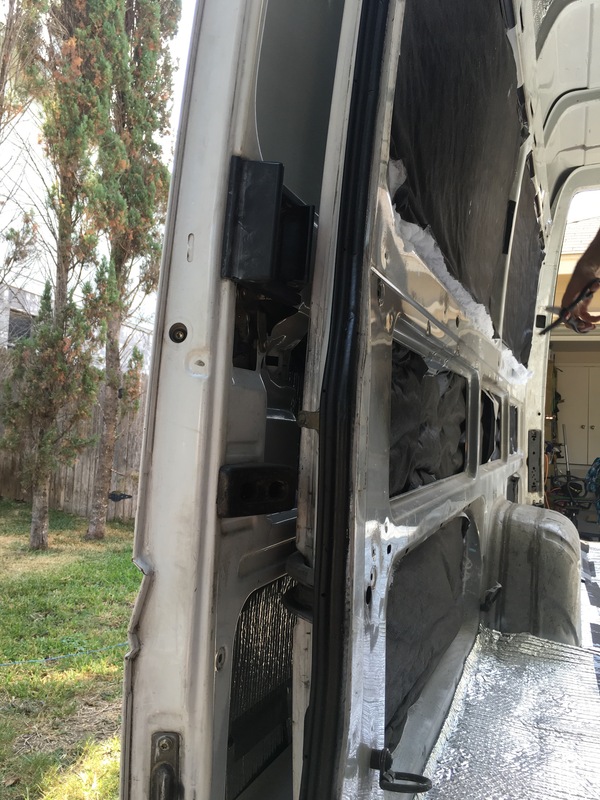 5 months of #vanlife exploration to-date in this Sprinter, and we are quite pleased with the way our triple layer insulation design is working out. It gives the whole interior space a solid cozy feel, that’s protected from the elements, and free of morning dew. Even with the doors open, the inside is consistently staying degrees warmer or cooler than the outside tempatures. Shortly after we found the van, did some deep cleaning, and a little demo, we were ready to move to the insulation phase. By far the longest and least gratifying part of the conversion, there would be days of mess ahead, but proper insulation would mean the difference in making the van feel like a home, and not just a big rattling boat on wheels. As we (us, baby & pup) would be on the road in the van full time for a while, taking on both snowy and beachy weather, the insulation would need to offer a bit more then the basic heat and cool elements. With this being our first conversion, and all building being done DIY style, we also sought insulation that could be completed with minimal tools, and YouTube direction. It was clear some serious research would be needed before confidently committing to a decision. 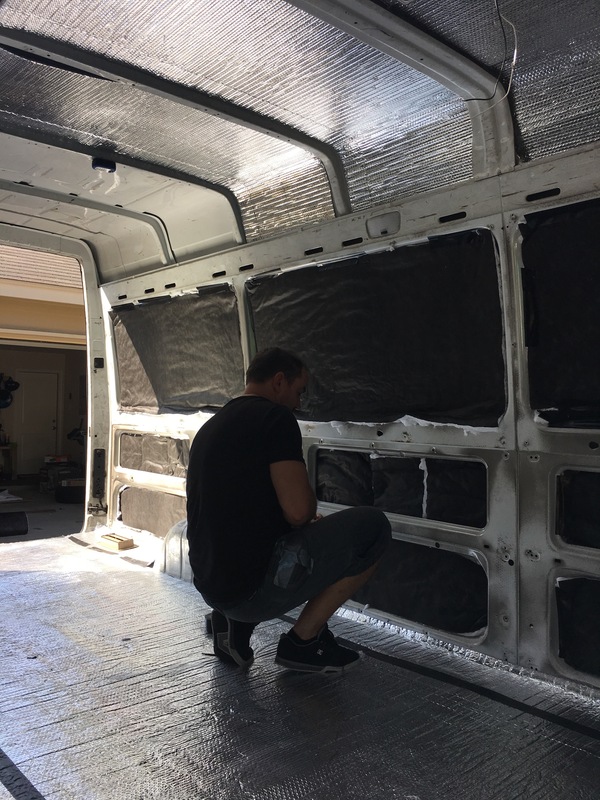 The first layer was easy, as just about every source from Wikipedia to YouTube, and any blog on converting a van all tell you to start with Refectix as the initial radient barrier. The same material sun shades are made of, it’s purpose is to reflect the heat. You can not have crying baby sounds coming from an unmarked van… you just can’t. It will kill you’re Urban Camp-abilities real quick. We narrowed it down to 2 non-flammable options that would be lightweight, and offer safe breathability for us and our little one; Thinsulate and Recycled Denim. The more popular, Recycled Denim is marketed as a good eco friendly insulation option for better indoor air quality over traditional insulation. We liked the recycled part, and that it’s made with non-carcinogenic materials, but it is fairly expensive, and not geared towards handling damp conditions. Our travels tend to always revolve around water, rain and snow so that knocked this one off the list. Our research then led us to Thinsulate, a synthetic version of goose down. Commonly used in a variety of cold weather attire for its breathability and moisture-resistant properties, but also used as insulation in some luxury vehicles for its quality sound absorption properties. Absorbing no more than 1% of its weight in water, Thinsulate fibers are made to reduce heat flow while still allowing moisture to escape, which allows it to retain its insulating ability, even in damp conditions. Yes! Similar in performance and breathable safety as that of Recycled Denim Insulation, but would preform better in damp conditions, and at a fraction of the cost? Sold! The final layer is a vapor barrier. We happened to have some reflectix left over, so added that over the floor and walls. Then we used black plastic sheething to finish off the ceiling, something we also happened to have on hand. A nice thing about this insulation design is should we ever need to disassemble the interior, or add additional wiring for any reason, it will be fairly easy to pull apart and then put back together. So, we look forward to that…yeah. Fill the voids as much as possible so air pockets are eliminated. No air equals no moisture available to condense on the metal.